In search of Sita, Hanumana was required to cross the ocean. Due to a curse on him, he was unable to do so despite having the powers within himself. Jambavant became the guide here and he sang praises for Lord Hanumana. This made him to realize his strength and complete the task of finding Devi Sita. After Jambvant praised and advised Hanuman, he started his journey to Lanka. Mainak came forward to offer some rest, but he declined. On his way, first came Sursa. She was asked to test Hanuman’s skills and wisdom. She said that everyone has to pass through her mouth before one can resume its journey. Hanuman has Garima and Laghima skills which he applied. He first enlarged his size. In reply, Sursa also increased her mouth. Suddenly he reduced his size and entered her mouth and came out of her nose. Sursa blessed him for his skills. By using his wisdom, he proceeded further. Soon, another hurdle appeared. A demon caught his shadow. The demon was Sinhika. She got the boon from Brahma that she can control anyone’s shadow. 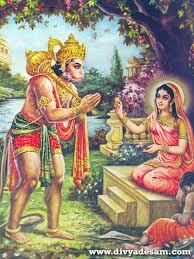 Hanuman had to overcome her before he could proceed. She managed to swallow him, but soon enough, he killed her and restarted his journey towards Lanka. 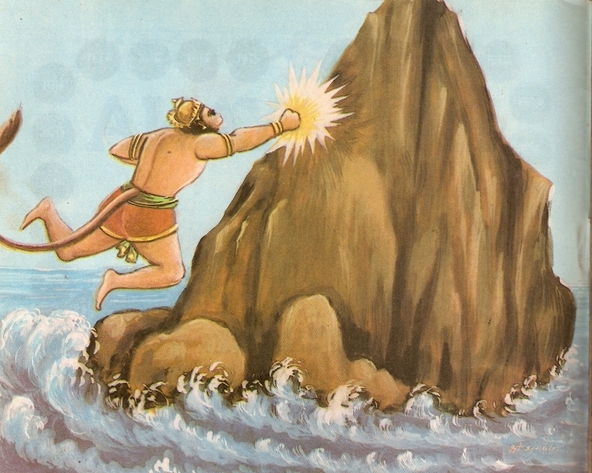 Hanuman reaches the shores of Lanka. He found that many demons are guarding Lanka. He decides to enter lanka in night but ran into Lankini. Hanuman hit her hard. 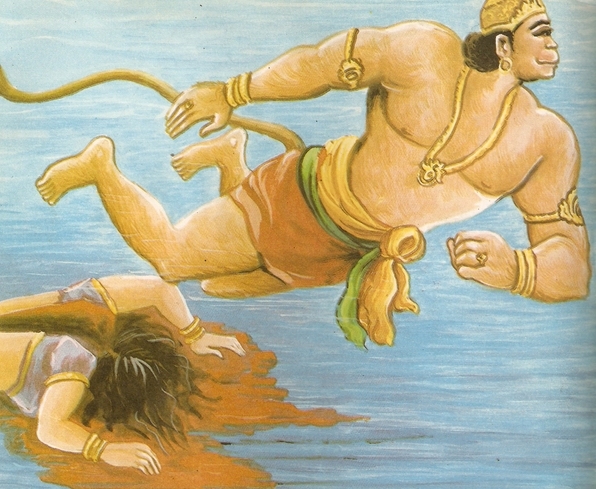 Lankini understands that end of Ravana is near as she was told by Brahma that when a monkey is cause of her pain, then it is time of end of Ravana. She praises his devotion towards Lord Rama. 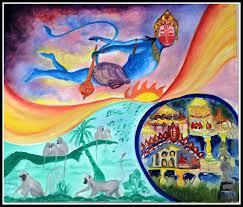 Hanuman then searches for Sita in Lanka. He even checked Ravana’s palace. Then he came to another palace, which was Vibhishan’s. He met him. Vibhishan told him about Sita whereabouts. He goes to Ashok vatika and observes Sita. She was sitting alone under a tree. At the same time, Ravana came there and threatened Sita with dire consequences, if she refuses to marry him. Trijata named demon consoles Sita. She said that she had seen in her dreams that end of Ravana is close. But Sita is still perturbed. Hanuman then dropped the ring given by Lord Rama before Sita. 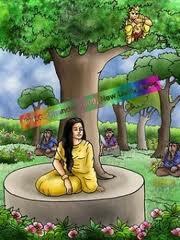 Sita becomes happy by seeing and recognizing the ring of Lord Rama. 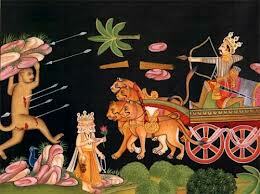 He then came before Sita and explained how he has come to Lanka and ashok vatika. He pacifies Sita that Lord will come soon and then it will be end of all the problems. 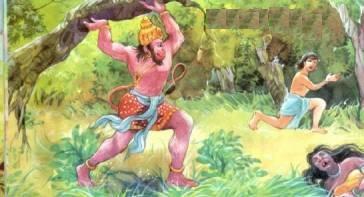 With permission of Sita, Hanuman then ate fruits from Ashok Vatika and uprooted many trees. He killed many demons including Akshaykumara. They went to Ravana for help. Ravana sent his warriors but they were defeated by Hanuman. Finally, Meghnaad used Brahmastra and used Nagpaash to tie him. Meghnaad then brought Hanuman to the Ravana’s court. Hanuman told Ravana to return Sita to Rama and live in peace. Instead, he asked to burn his tail so that a lesson can be taught to him. Hanuman made his tail become bigger. Lot of oil and clothes were required to cover the tail. Finally the tail was set to fire. Hanuman used laghima and became small. Lanka is thus burnt. Hanuman returns to Sita and seeks permission to go back. 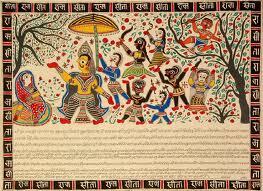 Sita gives her ornaments and requests them to be presented before Lord Rama. Hanuman heads back to Kishkindha. He meets Rama and Lakshman and tells them the whole story. he meets Rama and Laxman after returning from lanka. Then, Rama, Laxman and Hanuman, meet Sugriva and decide future course of action. After knowing the whereabouts of Sita, Rama sets out to free her. He is accompanied by Vanara Sena. Demons report this to Mandodari. Mandodari reasons with ravana as Hanuman, the messenger of Rama has done so much damage. Pregnant demons suffer from miscarriage when they think of Hanuman. So this is not wise to keep Sita. Ravana does not heed to the advice. Even Vibheeshana, brother of Ravana, persuades Ravana. Ravana insults him. 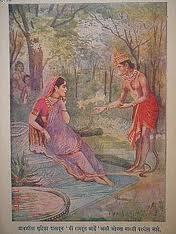 Vibheeshana meets Rama and requests for his companionship. Rama accepts him as his friend. Ravana sends his spy to Rama’s abode. Shuka, the messenger, was captured and Laxman releases him with a letter to Ravana. Rama requests Sea to give him way. When the sea does not listen, Rama intends to use Brahmastra. The Sagar yields and advises to consult Nal and Neela to find a way to Lanka. Do you know that Jambavant has seen a number of avatars (incarnations) of Lord Vishnu. He even got his daughter married to Shri Krishna and there is an interesting story of his fight with Lord Krishna. You can find this story on this blog. Thanks – We have similar story on BalKand which you may like. Thanks, You may like to read other Kands of The Ramayana, Bal kand, Ayodhya Kand and Kishkindha kand. very interesting and I enjoyed it alot. Jai Shri Sita-Ramji and Jai shri Hanumanji.